Officially, the Memorial at the edge of Arlington National Cemetery is the United States Marine Corps War Memorial. Virtually everyone on the planet, however, refers to it as the Iwo Jima Memorial. Cast in bronze and dedicated in November 1954, the Memorial depicts the rising of the Stars and Stripes over Mt. Suribachi on Iwo Jima on February 23, 1945, during the Battle of Iwo Jima, by five Marines and one US Navy corpsman. United States Marine Corps War Memorial, better known as the Iwo Jima Memorial. Though I’ve passed by it countless times, the Memorial is usually surrounded during the day by an almost impenetrable blockade of tour buses. There are few non-automotive methods of reaching the Memorial, as it is not near a Metro stop or most other visitor attractions. The parking lot on the circular drive around the Memorial is quite small, and the tour buses make them hard to reach, assuming they aren’t full. Solution: visit in the middle of the night. Admittedly, this presents some problems, as taking a “normal” picture is difficult without light. Flood lights shine on the Memorial, but floodlights on dark metal makes a photo quite challenging. The solution: patience, and a tripod. Or in my case, a monopod, which is one-third of a tripod. There are quite a few visitors even late at night, as you can see in the animation. Some of these drove up in cars, but even more arrived by tour buses. Apparently, night-time tours of DC are quite popular, overlooking for the moment that the Memorial, and Pentagon, and Arlington National Cemetery are in Virginia. The flag raising not only inspired the design of the Memorial but also the design of the National Museum of the Marine Corps in Triangle, Virginia, as a quick glance at the roofline will show. Someday, I hope to stop by during the day. Located at the edge of Fort Meade, Maryland, in an old, nondescript motel, is the National Cryptologic Museum. Admission is free, and with that admission you can explore how the worlds of communications, mathematics, and security intersect in cryptology. Photos from the National Cryptologic Museum. 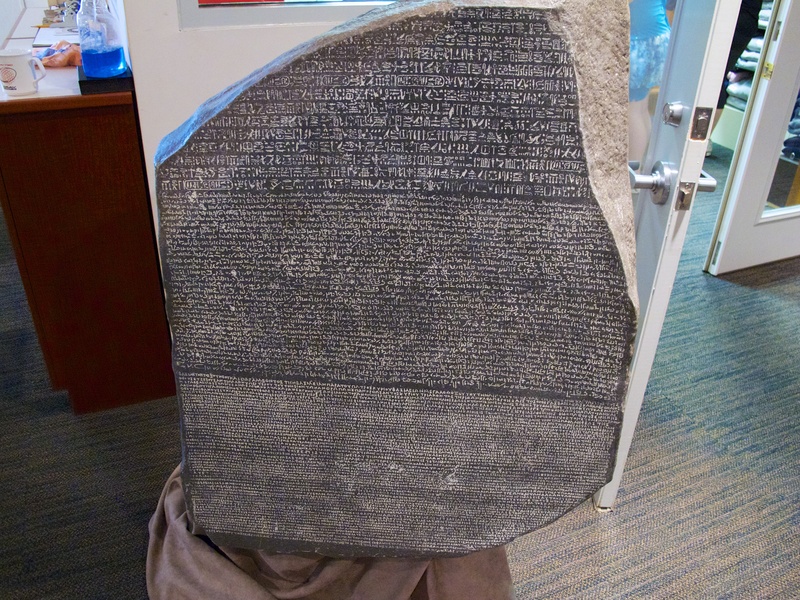 Outside the National Cryptologic Museum gift store is this replica of the Rosetta Stone. Created around 196 BC, it displays a decree from an Egyptian king, written in Egyptian hieroglyphs, Demotic script and ancient Greek. Discovered by a French soldier during France’s invasion of Egypt in 1799, it provided the key to unlocking Egyptian hieroglyphs, much as modern code breakers look for keys in breaking coded texts. The real Rosetta Stone is on display at the British Museum in London. Hebern Electric Code machine, built around 1918, was one of the first U.S. developed modern coding devices, with one rotor and nicely detailed brass segments. Like the Apple, it was Made in California, USA. The M-9 Bombe Checking Machine was a US device built in large numbers to perform brute force attacks on German codes during World War II. Several machines were fed the same code to find the proper rotor settings, and once found, the code could be translated. This Enigma machine and many variants was used by German forces throughout World War II. This particular device can be used by visitors to create their own secret messages. The German SZ42 Schlüsselzusatz, or cipher attachment, was developed by the Germans in 1942 for use by the German Army. The British nicknamed it “Tunny,” after a type of tuna. This seemingly random name was due to the requirement to call all German encrypted traffic “fish,” as a security measure. This Connection Machine CM-5 was built by the Thinking Machines Corp. It was used by NSA from 1991 to 1997, and was called “Frostburg,” after a college town in western Maryland. The many blinking lights are decorative. This Soviet made IMZ-Ural motorcycle is a Soviet copy of a German BMW R-71 motorcycle from 1941. It was captured from the North Vietnamese Army by the U.S. during the Vietnam War, and has not a thing to do with cryptanalysis.